Knowledge management continues to play an important role in management practice, in private and public organisations, in community informatics and in other groups. Once thought of as a fad it is now clear that knowledge management is an important issue which all organisations face and will continue to face for the foreseeable future. 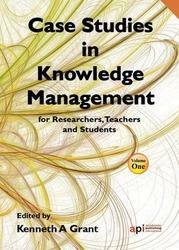 As a result the teaching of knowledge management and the research into its development as a field of study is of considerable importance to business schools, professional organisations, public sector bodies as well as to educators. Case studies can provide a contextual perspective on real world experiences in KM. This book contains 11 case studies chosen by Professor Kenneth Grant and it illustrates many of the important issues of which both students and practitioners need to be aware. These case studies should also prove useful as teaching examples. 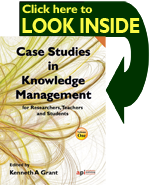 The case studies provided in this book cover subjects such as KM effectiveness gap analysis, the elicitation of intellectual capital performance, the reconfiguration of knowledge management practices and international strategic alliances. Private sector cases include examples from the pharmaceutical industry, manufacturing and consulting, while the public sector cases include the creation of a judicial environment, patient centred treatment in a general hospital and KM in the French Air Force fighter squadrons. The contributors to this book come from Australia, Canada, China, France, Italy, India, Malaysia, Spain, The Netherlands and The Untied Kingdom.